Our family recently added a new Christmas tradition, that being attending an annual community Christmas nativity display and celebration. The first two weekends in December, members in the community gather at a local church and display nativities from their own collections. This past year there were nearly 800 different nativities that were temporarily loaned to the community celebration. The picture that you see here is only a small part of what was displayed. There were 10 different rooms with varying nativity themes. 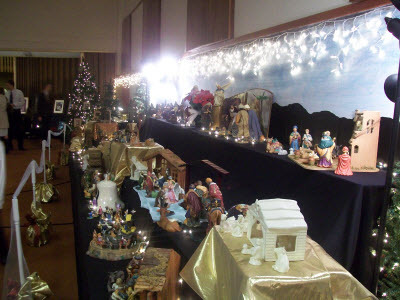 While viewing these nativity displays, community, school and church choirs perform Christmas carols. It is all very beautiful and will be a Christmas tradition for our family, and many others, for years to come. It helps remind us of the real meaning of Christmas.